We’d love your help. Let us know what’s wrong with this preview of Apocalyptic Montessa and Nuclear Lulu by Mercedes M. Yardley. Montessa Tovar is walking home alone when she is abducted by Lu, a serial killer with unusual talents and a grudge against the world. But in time, the victim becomes the executioner as 'Apocalyptic' Montessa and her doomed lover, 'Nuclear' Lulu, crisscross the country in Her mama always said she was special. His daddy called him a demon. But even monsters can fall in love. To ask other readers questions about Apocalyptic Montessa and Nuclear Lulu, please sign up. Although I've found myself souring a bit on science fiction lately, with my reading tastes driving me firmly back into the realms of epic fantasy, horror has always been my first love. It's what I remember reading first, and what has driven most of my own writing endeavors. So, while I hardly need an excuse to celebrate the genre, events like Women in Horror Month certainly do provide a convenient prompt for me to look beyond the towering review pile and into well-stocked TBR shelves that fill m Although I've found myself souring a bit on science fiction lately, with my reading tastes driving me firmly back into the realms of epic fantasy, horror has always been my first love. It's what I remember reading first, and what has driven most of my own writing endeavors. So, while I hardly need an excuse to celebrate the genre, events like Women in Horror Month certainly do provide a convenient prompt for me to look beyond the towering review pile and into well-stocked TBR shelves that fill my e-reader and (quite literally) cover the house. 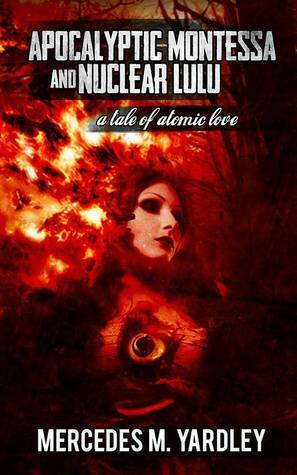 Ragnarok Publications is a publisher newly founded in 2013, but I'd heard of them prior to receiving a copy of Apocalyptic Montessa and Nuclear Lulu: A Tale of Atomic Love. These are the amazing folks behind the Kaiju Rising: Age of Monsters anthology Kickstarter, which was successfully funded this fall and quite possibly one of the coolest projects I've ever backed! It was thus an honor and a pleasure to be offered a chance to read and review their inaugural title by Mercedes M. Yardley. Don't let the quirky title fool you; this is one dark and disturbing tale of supernatural love and horror...because after all, even killers and monsters can fall in love. Montessa Tovar, an exotic dancer who has only known a life of hurt and abuse is abducted one night while walking home by Lu, a serial killer whose unusual power has led him to be labeled a demon. But in time, the victim becomes the accomplice. As the two continue to form the deepest of connections, Lu leads Montessa on a cross-country tour of blood and vengeance. Have you ever asked yourself if you believe in the concept of soulmates? Of finding that one person out there who completes you? This is the idea explored in the book, though if you find the notion utterly romantic, be sure to brace yourself because the author does not do it in a conventional way. It is far from idyllic; characters are depicted in extreme or frightening situations, and there is blood and violence and killing aplenty. It is, however, still a love story, and everyone knows how much I enjoy those. Most surprising of all is that in the darkness, there is also a heart-wrenching beauty. All black outfit, complete with full length duster? Check. Lights turned off, except for the cool skull lamp from Hot Topic? Check. Playlist set up, containing nothing but lots of The Cure and Creep by Radiohead? Check and Check. Ok, I think I am in the proper mood to read a story of love between two serial killers. Montessa is a special; her mother knew it when she named her while walking through a graveyard. (In the right mood for a horror tale yet?) She has the ability to read people a little better than most; perhaps not the gift it seems to be. Lu drives a big rig and constantly needs to feed a horrible hunger. He watches Montessa for a while. Learns her patterns. Knows the abusive boyfriend will flake, and pounces when the chance comes. Then watches her destroy all his careful plans. The victim becomes the partner; age old wrongs are righted (or double wronged if you insist on being mathematically correct). How does a killer react to a person whose soul is almost dead and is unafraid of death? Is there a difference between Stockholm syndrome and true love of destiny? Can two people who don’t believe in soul mates actually be soul mates? If these are the type of questions that keep you up at night then I have a hell of a tale for you. This is a fucked up story but I see its appeal. Not being a horror reader I certainly am not the intended audience by found myself entertained anyway. Something about the writing just worked; I was often more interested in the craft than the details of the story. The minor supernatural aspects elevated the story; and the relationship was unique if nothing else. The best parts for me came from the way Montessa read people; and how the effects of that knowledge changes as she goes through here strange reawaking. 3 stars for me, but this could purely be a genre issue. People looking for a redemption arc in every story they read will hate ever last word. Horror fans are getting a well written novella, and perhaps a story more up their alley. Now if you excuse me, I can’t listen to another damn song from The Cure. And black eyeliner just doesn’t work on me. I may listen to the Radiohead song a few more times though. Mercedes is a master at plucking out secret emotions we wish we could describe and painting them into a portrait of emotion that overwhelms like a thousand small cuts only reality can heal, but it feels so real you wonder if you were more alive inside her prose than you are now that you're gone. The best part is that after you've left, the story's emotions remain tattooed, a memory of beauty and suffering to take with and enjoy at will. A favorite quote from Apocalyptic Montessa and Nuclear Lulu: Mercedes is a master at plucking out secret emotions we wish we could describe and painting them into a portrait of emotion that overwhelms like a thousand small cuts only reality can heal, but it feels so real you wonder if you were more alive inside her prose than you are now that you're gone. The best part is that after you've left, the story's emotions remain tattooed, a memory of beauty and suffering to take with and enjoy at will. "Your first kill?" she prompted. He faced her then, and the look on his face was the expression of two faces in constant battle with each other. One of snarling hate, a primitive fierceness that made Montessa want to close her eyes, to turn her throat away from his canines. The other, that was the real Lu. A sad, miserable, trapped boy inside a man's body. Someone who cried while he sliced seams in suits of flesh. Somebody who nervously ran bloodied hands through his dark hair, spiking it even more than usual. "Lu. And Lu. Lulu," she said, and was surprised when he laughed. It was a bitter sound, the sound of comfrey petals and bryony boots, things mixed together that shouldn't be, and Montessa's stomach lurched again. I'm a sucker for a good love story, especially a bloody one! True Romance being my all-time favorite. Not quite Clarence and Alabama, the story of Montessa and Lu is another well-crafted piece from Mercedes M. Yardley. The story of two broken and special people who fall for each other in an unorthodox fashion, with Lu eventually leading Montessa on a journey of vengeance. I loved Montessa, and found myself feeling bad for the way she treated herself and for the way she allowed herself to be treat I'm a sucker for a good love story, especially a bloody one! True Romance being my all-time favorite. I loved Montessa, and found myself feeling bad for the way she treated herself and for the way she allowed herself to be treated. I also really enjoyed her initial conversations with Lu (especially with her life hanging in the balance). That doesn't stop the love story from working though. It's pretty easy to see how Montessa could fall in love with him. No one else could empathize with his past. No one else could understand the monster within the way she could. I was able to enjoy the lighter moments of the story, and that doesn't surprise me in the least, the author has proved in the past to be quite capable at writing softer moments hidden among horror and darkness. It's one of her gifts as a writer. Wow. Simply wow. I was so floored by this small book that I've read it over the course of a single day. APOCALYPTIC MONTESSA AND NUCLEAR LULU was like an Oliver Stone script directed by Wong-Kar Wai. A love story between two lonely, broken souls hanging to existence by any means necessary. I don't want to say too much not to ruin the experience, but I'm a stickler for love stories that feel real and while APOCALYPTIC MONTESSA AND NUCLEAR LULU is so intense it sometimes flirts with melodrama, it Wow. Simply wow. I was so floored by this small book that I've read it over the course of a single day. APOCALYPTIC MONTESSA AND NUCLEAR LULU was like an Oliver Stone script directed by Wong-Kar Wai. A love story between two lonely, broken souls hanging to existence by any means necessary. I don't want to say too much not to ruin the experience, but I'm a stickler for love stories that feel real and while APOCALYPTIC MONTESSA AND NUCLEAR LULU is so intense it sometimes flirts with melodrama, it gets the job done quite well. Aside from the longest title, ‘Apocalyptic Montessa and Nuclear Lulu: A Tale of Atomic Love’ is one of the most pleasant surprises I’ve read in a while. Yardley’s whimsical prose and vivid dark imagery made for an exciting story. The story follows Montessa, a stripper trapped in an abusive relationship, who is kidnapped by a serial killer hoping to go out in a blaze of fire. What begins as beauty and the beast quickly transforms into the story of two dark soulmates discovering one another. Great Aside from the longest title, ‘Apocalyptic Montessa and Nuclear Lulu: A Tale of Atomic Love’ is one of the most pleasant surprises I’ve read in a while. Yardley’s whimsical prose and vivid dark imagery made for an exciting story. An intense, beautiful, captivating, and twisted read. This dark, gruesome, yet truly romantic love story captured me from the first page. Apocalyptic Montessa and Nuclear Lulu is a tale about two crazy kids in love that reminds me of Natural Born Killers. It’s not exactly a conventional relationship since Lulu kidnaps Montessa with the intention of killing her. But all relationships must start somewhere. The story mostly takes place in a truck, which Lulu drives as part of his job. Montessa is a stripper involved in an abusive relationship with the worlds biggest a***ole, so in comparison to that creep, a serial killer truck drive Apocalyptic Montessa and Nuclear Lulu is a tale about two crazy kids in love that reminds me of Natural Born Killers. It’s not exactly a conventional relationship since Lulu kidnaps Montessa with the intention of killing her. But all relationships must start somewhere. The story mostly takes place in a truck, which Lulu drives as part of his job. Montessa is a stripper involved in an abusive relationship with the worlds biggest a***ole, so in comparison to that creep, a serial killer truck driver isn’t so bad. What most impressed me about this story was the quality of the writing. It’s hard to describe, but the writing had an almost lyrical quality to it. The flow of the sentences, the language being used, the way it’s all put together, is done in such a way that evokes the right atmosphere for this story. The author hit all of the right notes in putting this story together. As a fellow writer, I can appreciate the skill level seen in the writing, and found it to be an enjoyable read. You might have a hard time getting over the fact that a woman would be willing to have a romantic relationship with a person who kidnapped her and wants to kill her. I know that I did. So, there needs to be a certain level of suspension of disbelief that has to be applied in order to get into the story. But if you can get past that, there is a lot to like inside of the pages. I would suggest giving it a read. You won’t regret it. Life isn’t always cut-and-dry. Sometimes, the most terrible of circumstances can directly lead to the most wondrous acts of creation. A personal tragedy can spur an artist to craft their life’s seminal work. Addiction can result in the addict steering an otherwise ill-fated existence onto a path of hopefulness. Society can rally around a national catastrophe, bringing people together, opening up pathways to communication and goodwill. This is true even on a cosmic scale, when something as violen Life isn’t always cut-and-dry. Sometimes, the most terrible of circumstances can directly lead to the most wondrous acts of creation. A personal tragedy can spur an artist to craft their life’s seminal work. Addiction can result in the addict steering an otherwise ill-fated existence onto a path of hopefulness. Society can rally around a national catastrophe, bringing people together, opening up pathways to communication and goodwill. This is true even on a cosmic scale, when something as violent as the Big Bang leads to the creation of life, itself. And sometimes, an abused woman and a serial killer can find love, because existence can be the darkest of jokes, whose punch-line is hidden beneath layer after layer of human frailty. It is a play in ten thousand disjointed acts without an ending. A contradiction that is at once both alluring and terrifying. Apocalyptic Montessa and Nuclear Lulu is all of this, and so much more. Mercedes Yardley, as an author, is herself a contradiction. Her work is darkly whimsical, gorgeously macabre, optimistically cynical, and outwardly aloof, with a dash of cheerful angst thrown in for good measure. Her gift with prose is magical; she’s very nearly creating long-form poetry, channeling every bit of darkness you could imagine, stuffing it into a black hole, churning and squeezing and choking the emotions for all they’re worth, and spitting out something absolutely breathtaking on the other side. I really cannot say enough about this book. Sure, you can likely find many antagonists as depraved as Lulu the serial killer. Yes, there have often been Fallen Woman heroines that are as lonely, pathetic, and cursed as Montessa. But you would be hard pressed to find another work of fiction that could demonstrate as much dreadful wonder in their mutual discovery of each other. One is evil, the other tortured; together, their story is somber, ugly, and yet eye-mistingly wonderful. And yes, there is a message lurking within the beautiful prose, hidden in the glint of Lulu’s First Kill Knife. Buried beneath the layers of Montessa’s abuse. Lingering inside the suffocating miasma of ambiguity that governs both of their thoughts. But what that message is, is up to you to decide. That is the last contradiction Yardley has given you. Damn, how I love this appallingly beautiful book. Awesome book. Great writing. Very sweet and quirky style even though the story and the message behind it are kind of dark. Go read it! It was a great book. It was however, a little dark for my taste. I did enjoy it though. I won this book in a giveaway so it was worth the read. I loved this. The best novella I've read in a long time - think Natural Born Killers with supernatural undertones. I won’t lie. I’ve read the book because of the title. It showed on the Goodreads Readers also enjoyed feed of Seth Skorkowsky Hounacier and once I saw it, I just had to try it just to see what kind of story is hidden behind such an amazing title. It turns out it’s a love story. But instead of chocolate and roses, our lovers share eviscerating others. It’s a short story of a blossoming romance between an Asian-American serial killer and a stripper he kidnapped. Nuclear Lulu and Apocalyptic Montessa I won’t lie. I’ve read the book because of the title. It showed on the Goodreads Readers also enjoyed feed of Seth Skorkowsky Hounacier and once I saw it, I just had to try it just to see what kind of story is hidden behind such an amazing title. But instead of chocolate and roses, our lovers share eviscerating others. It’s a short story of a blossoming romance between an Asian-American serial killer and a stripper he kidnapped. Nuclear Lulu and Apocalyptic Montessa do horrible things together but they also love in a very real and fierce way. Their romance is self-consuming and baptized in tears and blood. As melodramatic as it may sound, it’s very well written book that’s not afraid to go to very dark places. it was easier to be with a man who wanted to murder her, and would appreciate it than be with a man who would only beat her to death. Lu is a serial killer who loves to make people suffer. It’s his true calling. It’s something he does well. Their relationship evolves quickly and they end up meaning the world to one another. Despite their flaws and craziness Lu and Montessa are endearing. Apocalyptic Montessa and Nuclear Lulu doesn't idealize love. Neither does it try to sell it to you. Love is presented as a violent thing rooted in imperfection. There’s a little world outside a pair. Other people appear but they’re barely sketched. The focus of the story lies elsewhere: in picturing impossible and yet relatable romance with words and sentences. He held out his hand. She walked over and took it. Sparks flew. Magic happened. Nuclear reactors melted in joy. The world combusted. Not everyone will like this style. I loved it. It’s strong. It delivers feelings pretty well and, in places, sets a bit surreal ambiance. Overall, it was something else. The book is very short and strong. It’s dark and twisted take on the topic of soulmates. Obviously, some moral questions may arise as we start to cheer for a pair of psychotic killers and it’s good to think them through. One of the best twisted romances I've experienced since Natural Born Killers. Yardley wields her pen with a skillful hand, not wasting one word. Her keen insight into the human condition and our darkest emotions make for a wonderful tale. She urges the reader to care about a violent, deviant character normally shunned by society, addressing the age old debate of nature versus nature. She also addresses the delicate issues of domestic abuse and child abuse with artful grace. I loved this novella! It's probably rude to start off by mentioning another author, but here I go. I recently discovered the writings of Laird Barron. At last,something new and different. I ran through his work like lightning and thought I would not find anything that good for a while. Along comes Mercedes M. Yardley and her seductively titled novella, "Apocalyptic Montessa and Nuclear Lulu: A Tale of Atomic Love." I began reading and I was stunned. First of all, her writing is to die for, her style and use of prose It's probably rude to start off by mentioning another author, but here I go. I recently discovered the writings of Laird Barron. At last,something new and different. I ran through his work like lightning and thought I would not find anything that good for a while. Along comes Mercedes M. Yardley and her seductively titled novella, "Apocalyptic Montessa and Nuclear Lulu: A Tale of Atomic Love." I began reading and I was stunned. First of all, her writing is to die for, her style and use of prose is like no other I have read. It is seductive and compelling, hypnotic even. As the tale began, I thought, "great, my favorite mythic theme, beauty and the beast." I actually cheered at Montessa's acceptance of her apparent fate, death at the whim of a serial killer. She baffles her abductor through her absence of abject terror and her refusal to beg for her life. Lulu, or Lu, as he is known at this point in the story, simply doesn't know what to make of this. So, Montessa = Beauty; Lu = Beast. Simple, right. I don't want to retell the whole story here. Through her extraordinary storytelling skills and her beautifully twisted psyche, Ms Yardley unwinds a story in which Lu,the Beast,brings out the Beast in Montessa and she brings our the Beauty in Lulu, as Montessa has now named him. That Yardley accomplishes this while telling the story of two serial killers is a literary feat the likes of which I have never before seen. This is brilliant prose, extraordinary storytelling. Hate, revenge, fear, sorrow, regret, tragedy and triumph are all woven skillfully into this glorious novella. I admit, it is not for the faint of heart, nor for those who fear the darkness in their own souls. It is for anyone who loves superb writing with a taste for the unusual. Think H. Ellison, Robert Bloch, et al. Think about reading something the likes of which you have never read before. I can't wait to get caught up with her other short stories. Her first novel is coming. It can't get here soon enough. Lulu and Montessa beat the odds and overcome their differences to find the true depth of love. What are those differences you may ask? Welp, he being cut from the leather apron of serial killer, and she woven from the silk of kidnapped victim & their love is born on the cinder of impending murder. When his first-kill knife becomes her first-kill knife, the path that these element-crossed lovers are destined to take ignites with a ferocity all it's own. I've become a huge fan of Mercedes M. Yardley and she has quickly been added to the short list of "must-read" authors. Her ability to paint a strikingly gorgeous and painful picture through word is nothing short of awe inspiring. From the first page, this tale is sheathed in a slick duality. It is told under the guise of beauty, only when you take a moment to think about what you've just read is when you're blindsided by just how heavy it is. Like the pairing of opposite colors on the spectrum, It's mentally exciting. Her style reminds me of a Ramsey Campbell or Clive Barker yarn, maybe not as much in style but in the deceptive way that the delivery takes form as character in it's own. A master puppeteer, deceptively showing you what it wants to show you, holding back on what you are not ready for and eschewing that which does not matter. But rest assured that a Yardley tale will teach you a thing or two about what makes you feel, and how you feel it. Apocalyptic Montessa and Nuclear Lulu, by Mercedes Murdock Yardley. Confession: I had never heard of this book, and (originally) ordered it so that I could see the quality of books Ragnarok Press is putting out. It's on the short side. I love doorstoppers; I read very quickly, and I love to be completely enveloped in a new world for hours on end. I looked at the cover, read the blurbs, turned it around in my hands, and thought, huh. It's kinda short. And then I opened this little handheld incendiar Apocalyptic Montessa and Nuclear Lulu, by Mercedes Murdock Yardley﻿. And then I opened this little handheld incendiary device and read the first few words, and I thought, huh, she can write. And that was the last thing I really thought for the next couple of hours. My kids wanted my attention, my dogs wanted fed, and I sat in my reading chair engulfed in dark flames, snarling whenever anyone approached. I never wanted it to end. I wanted a happy ending, though I knew full well a happy ending was nowhere to be found in this slim, powerful volume. What are you still doing, reading this review? Go buy this book. Because it's so good it burns. "Natural Born Killers," meets "Romeo and Juliet." In Yardley's novella, the two characters do despicable things and should be disliked, but they are made into sympathetic romantics. The story surprised me: while I expected to be steered towards trying to like the characters, I didn't expect to not dislike them at the same time. Make sense? Read it again. Montessa is damaged beyond repair, too damaged to really understand and control herself sometimes. However, her time with Lu gives her hope and "Natural Born Killers," meets "Romeo and Juliet." In Yardley's novella, the two characters do despicable things and should be disliked, but they are made into sympathetic romantics. The story surprised me: while I expected to be steered towards trying to like the characters, I didn't expect to not dislike them at the same time. Make sense? Read it again. Montessa is damaged beyond repair, too damaged to really understand and control herself sometimes. However, her time with Lu gives her hope and respite, and provides the beginning of understanding. Lu, on the other hand, knows he's damaged, and has embraced that state. He's controlled, and in control, until he meets Montessa. Montessa and Lu are the Bonnie & Clyde of horror fiction. Star-crossed / ill-fated, yet somehow finding a red thread of hope and understanding within each other. Yardley's writing is crisp and clear, and it's the many juxtapositions of the story that make it shine. I loved the descriptions, seemingly discordant, but so perfect and apt in that disharmony: "...it tasted like roses and barbed wire and butterflies." Wow, what a book. I usually don't read love stories, but this one was totally worth it. It's one of those stories that once you reach the end, you just sit there, pause, and just... feel. The author doesn't shy away from ugliness, she doesn't sugarcoat. It was dark and twisted and bloody. There were so many "wrongs" in the characters, the story, everything. It was absolutely stunning and beautiful in all its twistedness. I found myself sympathizing with both Montessa and Lu and maybe understood bo Wow, what a book. I usually don't read love stories, but this one was totally worth it. It's one of those stories that once you reach the end, you just sit there, pause, and just... feel. I found myself sympathizing with both Montessa and Lu and maybe understood both of them a little too well. Maybe I should be worried about my own twisted mind? Those who like to think of their world as happy, or even black-and-white, probably won't enjoy this as much. It might not make your day, but it'll grow inside you, shake you and leave its taste in yor mouth for a while. All of the dark swirling emotions from her short story collection, Beautiful Sorrows, are honed down to razor sharp precision and unwavering focus in this book. From the very first page you're drawn into their world, one that is incredibly dark yet blindingly beautiful. People wish they had one-tenth of the passion that Montessa and Lulu shared in their own lives. This is a tale about broken people from broken lives doing broken things. A love so all-consuming that the world would not allow it. Y All of the dark swirling emotions from her short story collection, Beautiful Sorrows, are honed down to razor sharp precision and unwavering focus in this book. From the very first page you're drawn into their world, one that is incredibly dark yet blindingly beautiful. People wish they had one-tenth of the passion that Montessa and Lulu shared in their own lives. Wow! This is a love story like no other I've ever read. And between two killers! I'm a fan of this author's writing style and storytelling, and this novella is a bit on the darker and gruesome side of her other works I've read, but that's not a bad thing. I loved it! Prepare yourselves for one helluva ride. Mercedes M. Yardley is a dark fantasist who wears stilettos and poisonous flowers in her hair. Her short story collection, Beautiful Sorrows, came out in the fall of 2012, and her novella Apocalyptic Montessa and Nuclear Lulu: A Tale of Atomic Love came out in September of 2013. Her debut novel, Nameless: The Darkness Comes, released in January 2014. It is the first book in The Bone Angel Trilogy. Mercedes M. Yardley is a dark fantasist who wears stilettos and poisonous flowers in her hair. Her short story collection, Beautiful Sorrows, came out in the fall of 2012, and her novella Apocalyptic Montessa and Nuclear Lulu: A Tale of Atomic Love came out in September of 2013. Her debut novel, Nameless: The Darkness Comes, released in January 2014. It is the first book in The Bone Angel Trilogy.